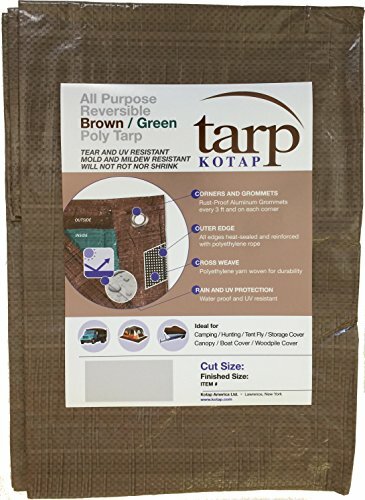 Kotap Brown/Green (5-mil) tarps are appropriate for those looking for a regular specification, light-weight, all-purpose tarpaulin in color other than blue. The tarpaulin's outside color is brown, and the inside color is green. These are ideal for: construction jobsites, roofing, painting, leaf/debris cleanup, camping, picnicking, hunting, canopy and tent fly. They are appropriate covers for equipment, boat, outdoor furniture, wood piles, or almost anything that needs protection for the weather elements.